Home :: WOOL Plaid Tartan Ribbon :: 1" Wool Plaid Tartan Ribbon :: SCOTTISH NATIONAL Wool Plaid Tartan Ribbon 10 x 54" strips x 1"
SCOTTISH NATIONAL Wool Plaid Tartan Ribbon 10 x 54" strips x 1"
Scottish National Tartan Wool Plaid Scottish Tartan Ribbon in a pack of 10 x 54" (1.37m) long x 1" wide strips. One pack of 10 x 54" strips is equivalent to 13.7 metres. Each 54" strip is hemmed and stitched in 100% pure new wool cut from the original wider material, so each strip will show a slightly different portion of the overall tartan... imagine the image above cut into strips. Pack of 10 strips, with FREE worldwide shipping. 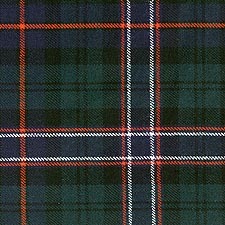 Wool Plaid Tartan Ribbon is produced to order, so we will ship your order inside 14 days. Because it is produced to order, Wool Plaid Tartan Ribbon cannot be returned if you change your mind. Please click here to see close alternative to Scottish National Tartan Ribbon.